Many of coach Chip Kelly’s philosophies have captured the imagination of the college football world. Fans and coaches alike are fascinated with Oregon’s use of the hurry up offense on steroids, four-panel picture signs to quickly communicate information to the players on the field, intense conditioning by way of hyper-speed practices and of course; in short, the continued development of the spread offense. There is one important Oregon tradition that predates the Chip Kelly era and the good news is it appears headed for round four. What is this tradition? It’s what I call the Two-Headed Monster, also known as the duel rushing attack. This behemoth first reared its head to terrorize opposing defenses at the turn of the century. It was then that Oregon running backs Maurice Morris and Ontario Smith showed up at the 2001 fall training camp and proceeded to grow into something bigger than either individual. They became the first pair of Oregon running backs to rush for over 1,000 yards in the same year. This Two-Headed Monster averaged over 183 yards rushing per game — no small feat considering that Oregon ran a traditional pro set offense at the time. In 2008 the Beast returned once more in the form of LeGarrette Blount and Jeremiah Johnson. This version of the Two-Headed Monster again saw both players rush for over 1,000 yards on the season while averaging almost 170 yards per game. One of my greatest memories was the destruction and mayhem unleashed on the Oregon State Beavers, who thought they were on their way to the Rose Bowl. By the time their heads quit spinning, the Monster left Corvallis with a 65-38 thrashing that won’t soon be forgotten. With a win under their belt and a second place Pac-10 Conference finish, the Ducks headed off to the Holiday Bowl to defeat Oklahoma State. 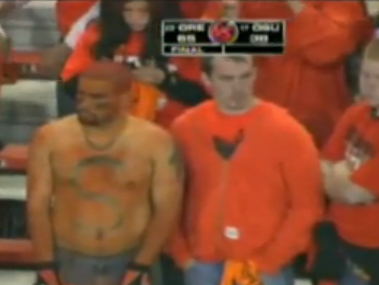 For the Beavers, thoughts of roses quickly turned to rebooked flights to El Paso. The Beavers’ search for Roses continues to this day. It didn’t take long for the Two-Headed Monster to rise yet again. This time it came in the form of LaMichael James and Kenjon Barner. This Monster grew to epic proportions averaging a massive 228.6 yards per game. The Monster was at its most ferocious when it led its Duck teammates to a 45-38 2012 Rose Bowl victory over the Wisconsin Badgers. So when will this Monster appear again? No one can say with certainty. But it is very possible that the incubation period has begun. Oregon freshman Byron Marshall at 5-10 and 201 lbs has shown potential this year while improving with every game. Next year he looks to be joined by two outstanding high school running backs. 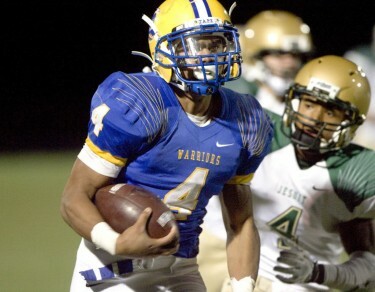 Thomas Tyner is a Scout 5-star RB recruit who has verbally committed to join Oregon next fall. A long-time commit, Tyner wavered for a short period before returning to his commitment to the Ducks. At this point it seems highly unlikely his commitment will stay anything but strong until signing day. When I watch Tyner I’m struck by two things; his unbelievable speed and his very large frame. Standing 6’1″ and weighing 218 lbs, it is readily apparent to me that he has significant ability to grow even larger and stronger. He looks like he could be a power runner in the mold of LeGarrette Blount, but while Blount is certainly not slow I’m pretty sure that he never ran a 10.38 second 100 meters like Tyner has done on the high school track. The combination of speed and size in the hands of the Oregon trainers and coaches is enough to make you drool at the future possibilities. Watching film of Tyner, I was surprised to see that most of his longest runs occurred when he got into the secondary untouched. I havn’t seen him break a lot of tackles yet. In some respects that is a learned skill and I’m sure that under the tutelage of Coach Campbell this will develop, as he certainly has the size to break tackles. Tyner runs with purpose and shows excellent ability to cut up field with authority when running wide. He appears to always be looking to run downhill and has excellent lateral movement when moving through the line of scrimmage. Excellent hands are a vital part of maximizing success in Oregon’s system, and Tyner has shown he has excellent hands when catching the ball out of the backfield and when lined up as a wide receiver. 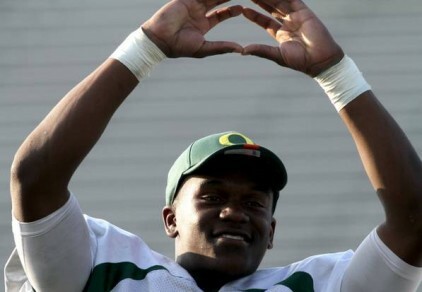 Tyner would seem to have a bright future working within the Oregon spread option offense. There is another running back who could very well form the second part of Oregon’s next Two-Headed Monster. Like previous Beast LaMichael James, Scout 4-Star RB Dontre Wilson hails from Texas. He reminds me of LaMichael James in many respects. At 5’10” and 180 lbs, he is slightly taller than James and may wind up being able to carry a little more weight. Running a time of 4.40, he certainly has plenty of speed. Wilson also reminds me of current Duck quarterback Marcus Mariota in one respect, in that defenses often seem to underestimate their speed. This is noticeable by the number of defensive players you see taking a bad angle and getting beat to the corner against both of these players. Like James, Wilson has the ability to quickly stop, cut, and accelerate away from defenders. He also breaks a lot of tackles. While I marvel at the physical potential of Thomas Tyner, I suspect that Dontre Wilson is more prepared to make an immediate impact. Time will tell, but don’t count me as surprised if we see Marshall and Wilson teaming up for the majority of the carries next year. Will they form the next Oregon Two-Headed Monster, or will the beast reincarnate in some other combination? Will it happen next year or will it take longer? All are good questions, and while I don’t have the answers I’m pretty confident that some combination of these three excellent running backs will form the Oregon Duck Two-Headed Monster, Version 4.0. Expect it sooner, rather than later. What are your predictions on the future of Oregon’s running game? Take a moment and share your thoughts below.